Before water the colour is clear olivine. It's natural and attractive. The aroma has a spicy kick, very similar to chili peppers. Sweet, a bit pungeant and nose-burning. Fruity. Anise is present but obscured by the strange aromas. The louche is attractive but a bit weak. Green or gold depending on the angle of light. Too thin to discern very many subtleties. With water the aroma is still full of chili pepper, with some wormwood peeking through. The flavour is very strong and complex. Lots of minty wormwood and that peppery flavour upfront, followed by citrus notes and maybe pine. Anise sort of wraps around everything, not being too obtrusive. There's a very subtle cheesiness that I've never tasted before in an absinthe. It's very crisp and tasty but also tremendously strange. Leans toward sweet as opposed to bitter, but not too far. It has a long, tasty finish with lots of wormwood, mellowing out to anise and fennel. This is just about the weirdest absinthe I've had. Normally something this strange is also pretty unpleasant. It actually kind of reminds me of Pulparindo candies, but without the overly sweet-sour taste. My total numerical score, being based strictly on the guidelines, doesn't properly represent how much I enjoy this. The US brands just keep getting better! After trying a few of the prototypes, I was extremely excited to see this hit the shelves! Color: A shade lighter than emerald. Similar to an unripened pear. Very attractive. Louche: I got some significant layering using ice cold water and the fountain. Fully louched around 2.5:1. Well formed and deep. Aroma: Powerful blending of herbs, with anise and wormwood at the forefront, with hints of citrus and flowers. It's a calming aroma. Flavor: As others have mentioned, the wormwood is top notch. It adds a wonderful Alpine spiciness and floral boquet. The bitterness is just right. Not over the top, and not too far in the background. The great thing about this absinthe is that you can 'explore' its depth because it doesn't fall apart easily with overwatering. I tasted different things at each ratio, with all of them being enjoyable. Finish: Creamy and smooth with touches of anise and allspice. Overall: While this brand is very deep and complex, I can see it winning favor both with experienced absintheurs and newcomers alike. There isn't as much of a chance of screwing up the dilution ratio, which will make this brand very user friendly for novices. Very well done! Unlouched, light medium lime green with amber glints. Louched, milky amber/green with really beautiful opalescence... blue, rose, corn-silk at the edges. Maybe a smidge on the lean side in color, but totally correct. Really good vibrancy to all colors. Rockin' louche. Really thick oily looking trails... some of the thickest looking and slowest to fall I have seen. Great layering and everything visible till about 1.2/1 at which point everything becomes opaque. Just about as good as it gets. Rivals the Jades. Prelouche, anise, citrus, caramel, herbs. Louched, really fresh, really clean, no off anything. This stuff is just crazy! So complex yet so balanced that any one thing is hard to discern. Good wormwood, for sure, but not that Pontarlier fruity style... tighter and more elegant. Anise and fennel right there. No alcohol heat, neat or louched. Herbals, florals, mint, and a little citric edge. Unbelievably clean! I can't take the time to count the flavors here! Wildly complex but amazingly reserved. Creamy, but not overly creamy mouthfeel. All the expected impressions in really precise measures. A nice spice. Ever so slight tongue numbing. A touch of talc. Total palate impression is one of great finesse and balance. Very fresh, clean, and focused. Not muddled at all. Gentle "pull" on the palate. Long, crisp, and clean. All aroma and palate impressions fade to anise and fennel, receding to a beautiful powderiness. There's a fine, fine spiciness that's like lying on a bed of pins! Tingly in the most nano sense. Gorgeous and classy, seamless nose and palate. Coming from the wine world, I always think of "American" style as something that comes at you like a freight train. This ain't that. This is ultra classy and fine. Balanced, stylish, reserved. Outstanding and complex nose and palate further punctuated by a texture that is akin to a finely grained tapestry. And for all this finesse, it holds up to the boldest of ryes in a Sazerac. Sha-wing! Something like this not only takes the vision, but the most adroit hand of a skilled artist. I recently said in a review of Jade PF 1901, that "You could make the argument that this defines modern absinthe at the high end, and you may not win, but you're not going to loose. " This is likely the other side of the argument. 01/28/10 Revisit - Every time I taste this absinthe I am astounded. I remember hearing Lance Winters say "It's taking a number of super loud ingredients, and making them all sing in harmony with one another. " If that's the case, this should be nominated for a Grammy. There is nothing timid about this offering. In fact, many of the choices made here are very brave... certainly not a case of playing not to loose. And yet, the entire tone is tempered with a maturity that does not need to shout "Look at me, Look at me! " From the beautifully translucent louche, to the addition of orris, to the insanely high quality of ingredients that allows for any dilution within reason, MAdlBE is a portrait of competence. All original notes remain unaltered. All original scores remain the same, with one exception... I have changed the score for "Overall" from 4 to 5. Congrats Gwydion, I am so looking forward to your future offerings. Done with a 1 ounce dose, diluted 3/1, 4/1, 5/1 and no sugar. The much anticipated release of Marteau de la Belle Epoque will very appropriately attract much attention from the absinthe community. 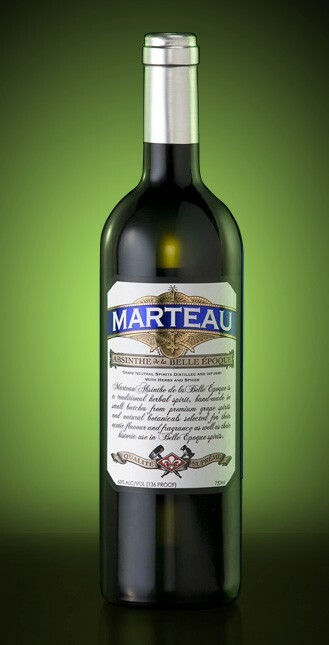 Created by Gwydion Stone, founder of The Wormwood Society this absinthe will be the subject of world-wide scrutiny as Marteau finds its place among the best offerings of Europe. It is skillfully crafted, well-balanced and is a delight to the palate. Color is a very pretty peridot that really does present well in full sunlight. The aroma before water is interesting - balanced but something else is hiding in the shadows. Louching is very, *very* particular with this one. I find that if I don't use a very slow drip with very cold water that things turn out too thin and not only the louche but the mouthfeel and flavor is also impacted. With proper care... it louches quite nicely if one takes the necessary care and time and brings out a complex assortment of flavours to enjoy! Using a bubble-glass, I can almost guarantee proper preparation so long as the water is cold enough. The finish is where those spicy notes really rise up and make themselves known - but they are present in the drink proper as well. Nice "coating" of the mouth and a well-rounded finish with slight numbing. Really well-rounded. A nice absinthe with all of the expected pieces falling into place along with a certain spiciness I cannot place, but enjoy nonetheless. Watch that louche! Color: A few shades darker than lime. A clean green hue, like a gemstone... beautiful. Aroma: Probably the most complex I have ever drawn in my nostrils! I can sense the classic alpine herb bill, a fresh talc scent, and strong citrus. There is something I pick up that is reminiscent of La Coquette & it's the Pdv. quality I like. It smells rich & strong neat. The aroma remains complex after the ice water is added, with the 'fresh' aspect dominating. I can't wait taste this! Taste: Very balanced - Tastes just like the aroma - perfect! No one thing dominates, such as anise or wormwood, however their presence is noted. I actually prefer to have a little sugar in this one. There's a little heat & punch at the start... a good strong drink! I tried different amounts of water - it doesn't seem possible to ruin it! Finish: Nice and lasting, very full, great feel. It has a subtle & seductive pull on my palate. Overall: I approached this tasting with an impartial head - I did not want to have unrealistically high expectations about it just because G. Stone also happens to be the founder of the web's best forum for absinthe education. Group mentality would state that one has to love this absinthe. Well, with that out of the way, I can honestly and safely say I absolutely love it, it's worth every penny, and is one of the absolute best absinthes that I have ever had - that's saying a lot! I look forward to tasting the handiwork of other U.S. craft distillers as well! Color: Marteau starts off very beautiful. A deep yellow-green that is clear yet solid. A very nice almost precious stone look, as if it was jewelry in my glass. Louche: The louche is wonderful when done properly with a slow cold drip. Anything other than that seemed to cause Marteau to be thin. It is also thin when a higher ratio is used. At 1:4 with an ice cold slow drip it louches like a dream though. Lots of oil trails dance around so it is wonderful to watch. One for sitting down and enjoying the experience, not a quick glass to pour. Aroma: The aroma is nice, it can be smelled from a nice distance from the glass but doesn't fill the room. Marteau has a certain spice to it as well as the herbs. The aroma itself is complex which can be tasted later. Intentionally taking a whiff will get you some alcohol heat, but just letting the smell hit your nose is very pleasant. Flavor: Wonderful flavor. This is herbal and spiced at the same time. With each sip I tried to pick out a new flavor, which is hard since it is so well balanced. At lower ratios it has some of that alcohol heat that you can smell which I prefer in my drinks. More water will bring out more flavors so adding more is not a bad idea for taste if you don't mind losing the alcohol flavor. Finish: The finish is a cool finish with some dancing of the flavors but overall it is as complex as the initial flavor is and doesn't change much else. There is a nice numbing sensation just a bit. Not as much as some other absinthes but still nice. Overall: This is a high quality absinthe with a wonderful taste and initial color. The louche is wonderful when done right but could use a bit more versatility. Aroma, Taste, and Finish are all done well which makes this absinthe a wonderful experience for the night. Has ruined other absinthes for me. Color: Clean and deeply colored, a fairly dark green/yellow (perhaps a bit more yellow than green.) Very nice. Louche: REALLY nice trails and swirling, having fully developed around 1:2. Beautifully multi-faceted. Sadly, I had difficulty keeping it from getting too thin when diluted to higher ratios, really wished it were a bit thicker. Finally got a great louche by using an *extremely* slow, cold drip. Aroma: Spicy and peppery, and already has the sweet smell I associate with sugar-cubed absinthe, eventually rounding out, with new scents coming forward at different water ratios. Flavor: Each sip is a new flavor: sometimes it's clean and fresh, sometimes it's sweet and heavy, bitter, spicy, flavorful green-ness, mouth-numbing mintiness, all with slight hints of alcohol at lower dilutions. Finish: I can only describe it as filling my entire mouth...I feel like the flavor of most of the absinthes that I've tried only fill the front of my mouth. It's tingly and fresh, yet warm and smooth, with a (good) earthiness, and it's almost citrusy-sweet. Overall: Complex, wonderful flavors. I like that there's a slight alcohol taste, enough to remind that it's an alcoholic drink but not in an overpowering way. At higher dilutions the thinness made it difficult to enjoy completely, even though the flavor and scent still held up very well. I felt like sometimes I had to sacrifice either toning down the alcohol flavor with thickness at times, but was much better when I carefully louched it, but still not ideal. Immediately after drinking my last glass of this, I made myself a glass of the absinthe I usually drink, and was hugely disappointed.